I tell you, it’s been a week of Mondays and the week isn’t over yet. Not having a working fridge the past four days has challenged my culinary skills. I’m on the countdown now, only 3 more days until the new fridge arrives. And we’re down to butter, a couple condiments, creamer, and warm beer. If we’re going to eat anything tomorrow, it’s coming home in a take-out box. When I found out we wouldn’t have a fridge for a whole week, I should have book a last minute trip somewhere. Anywhere. Maybe someplace with pineapples. I love fresh pineapple. It’s even better grilled. Or hollowed-out with a Mai-tai inside of it. 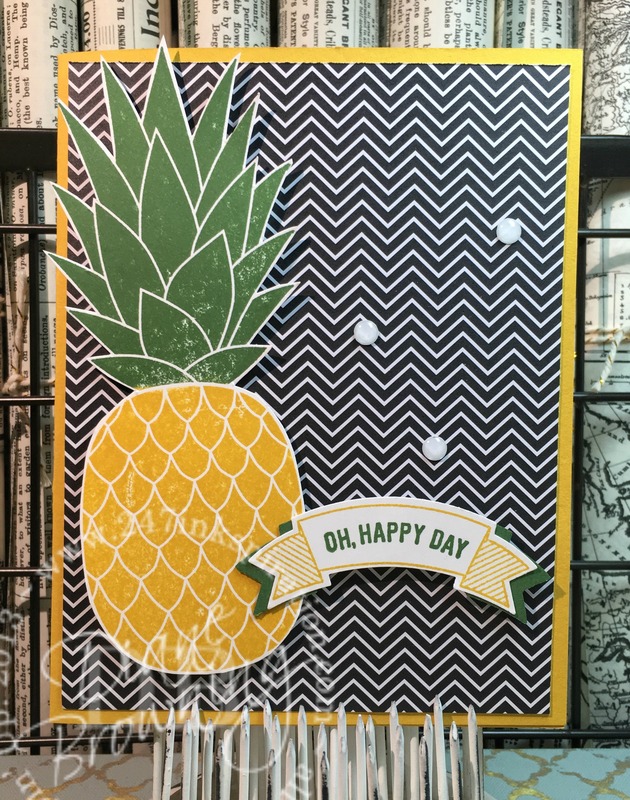 Speaking of pineapples, I am so excited about the pineapples in the new catalog. That giant pineapple is awesome! It’s about the size of a standard card front. I love the Pop of Pink Designer Series Paper. The bold black and white patterns are amazing and there are so many varieties to choose from. I took the time to cut out the pineapple and it’s was so worth it. It really didn’t take that long either because it’s not that detailed. 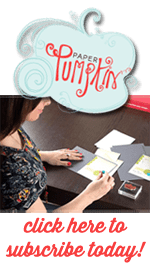 You could easily make this card in five minutes. To get the layered banner, I cut the Garden Green banner in half and then trimmed the part in the middle so it looked cleaner. 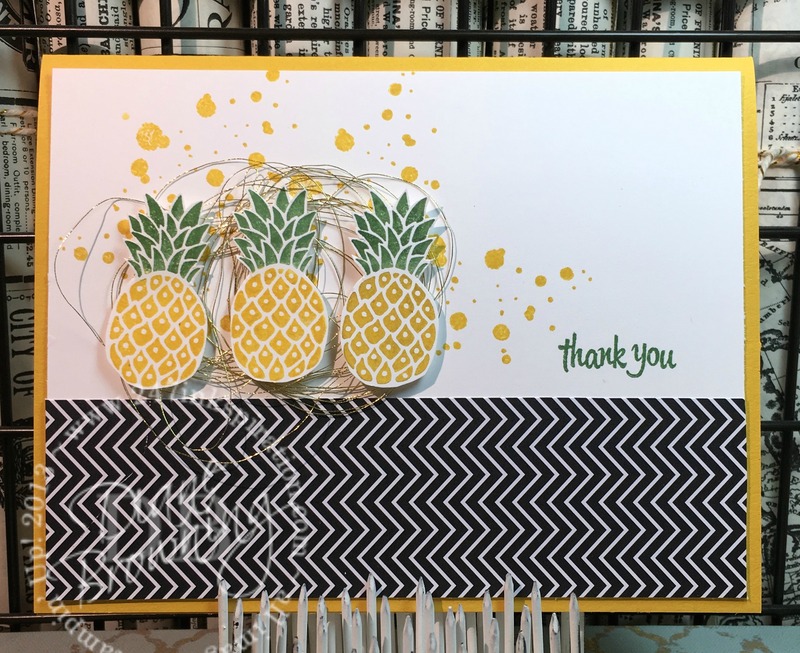 I mentioned on Wednesday that I had a bunch of the little pineapples leftover from the flamingo card. While I was in the pineapple mood, I came up with this quick card. I say “quick” because I already had the three pineapples cut out. If I had had to cut them for today’s card, it would have taken more than 5 minutes. I used to keep a little basket of these stamped images that didn’t make the final cut for a card. But I found I wasn’t actually using them. I either forgot I what I had in there or I was too lazy to dig through the basket. Lately, I’ve started putting those “extras” back into the case with the stamps. So far, that’s working better because I can tell at a glance if I’ve already stamped what I need. And that’s how I found these three little pineapples all ready to go! Don’t forget that Bonus Days started yesterday and goes through the end of the month. You can see the details here. I also have a couple new programs, which you can read about by clicking the links at the top of the page: 24-7 Ink Rewards, Free Catalogs, and Host Rewards. The 24-7 Ink Rewards and Host Codes are benefits when you place orders in my online store. If you have a favorite recipe for pineapples, I would love to hear about it. It’s one of our favorite fruits.